There are about 277 species of caddisflies in Minnesota but my list of caddisflies from Carlton County is dismally low at only eight species three of which are of uncertain identification plus several unknowns. 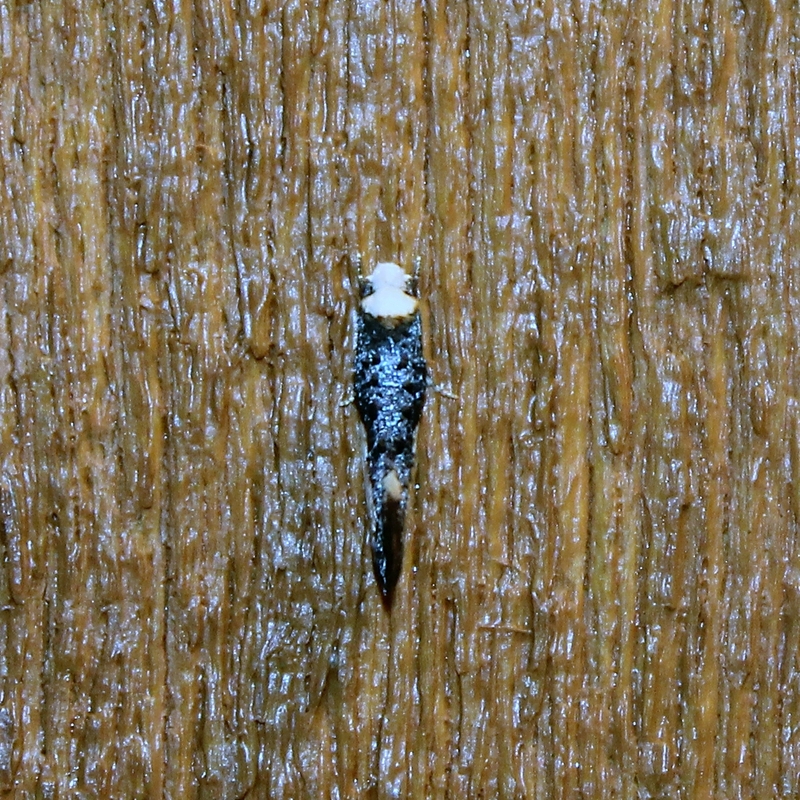 So when I saw this caddisfly a last week (May 31) I felt pretty sure I had a new species to add to the checklist. And it was. 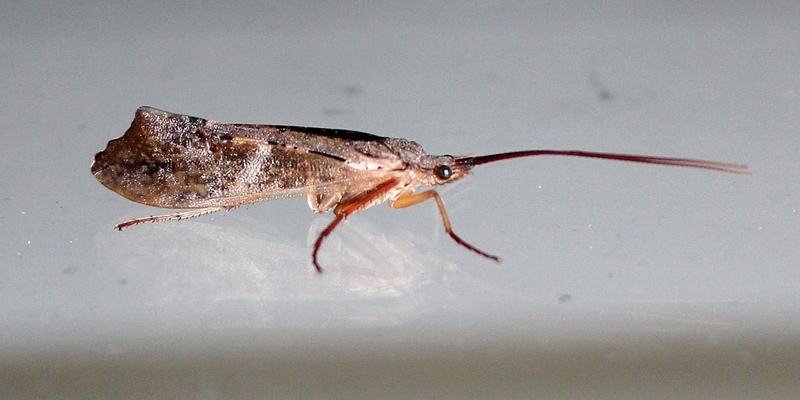 This caddisfly species is Nemotaulius hostilis which in Minnesota is known from several counties in the northern forested region of the state (Houghton 2012). The larvae of Nemotaulius hostilis build cases from large leaf fragments in such a way that they are sandwiched between the layers (Houghton 2012). 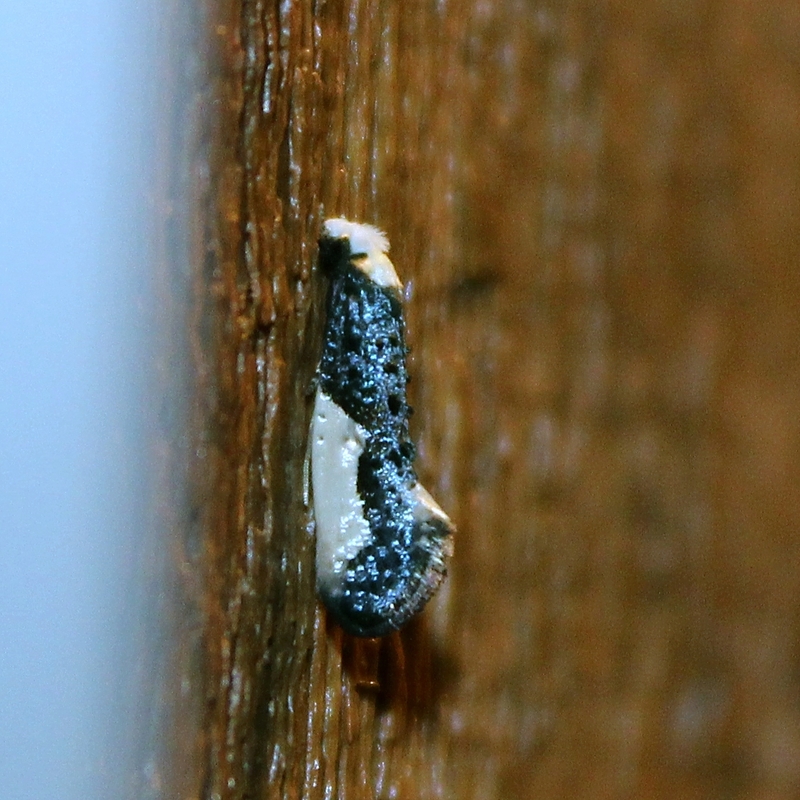 This is in contrast to the larval cases of other caddisfly species are tubular or rectangular in cross-section. Larvae live in lakes, marshes, and sluggish streams with thick beds of aquatic macrophytes where they feed on plant debris (Houghton 2012). The small stream that meanders through my property with its abandoned channels and ox-bows contains many sites with dense aquatic vegetation where I hope to find Nemotaulius hostilis larvae later this summer. The following description of Nemotaulius hostilis is after Schmid (1952), Nimmo (1971), and Houghton (2012). Adult N. hostilis are between 25 and 30 mm long. The coloration and patterning of the forewings is the most conspicuous feature. These are a mixture of solid areas of color, mostly shades of brown, gray-brown, or even black, mixed with clear irrorate (speckled) areas. Schmid says of the translucent speckling (“macules claires”) on the wings that it is “more extensive than in other species” and the wings are “riddled” with them (“l’aile dont toute la surface est criblée de macules claires plus grosses que chez les autres espèces”). The costa is hyaline with some basal irroration. About mid-way on the forewings is a narrow, slanted bright zone. The scalloped wing tips are a distinctive feature. Nemotaulius hostilis occurs from Newfoundland to Alberta and Alaska, and from New England to the Great Lakes Region, also in Colorado (Nimmo 1971). 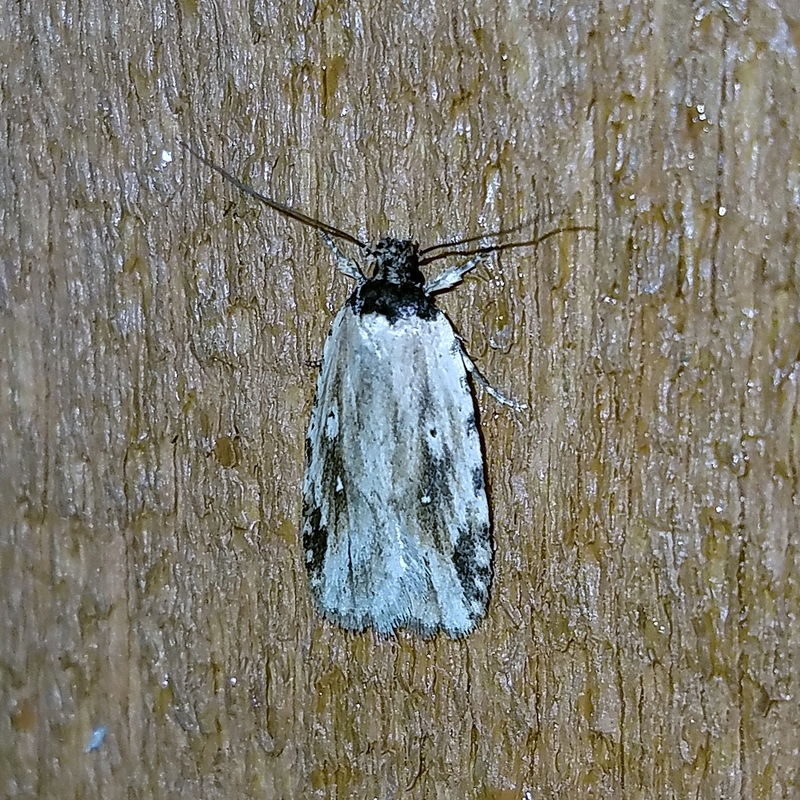 I found this caddisfly Monday night (June 4). It is one of the giant casemaker caddisflies in the Superfamily Phryganeoidea that is probably Ptilostomis ocellifera, a species which is widespread and common in Minnesota. More on Ptilostomis ocellifera in an upcoming post. Cummins, Kenneth W. (2002). Riparian-stream Linkage Paradigm. Verhandlungen des Internationalen Verein Limnologie, 28:49-58. Feio, Maria J., Vieira-Lanero, Rufino, Ferreira, Veronica , and Graça, Manuel A. S. (2005). The role of the environment in the distribution and composition of Trichoptera assemblages in streams. Archiv fur Hydrobiologie, 164(4):493–512. Houghton, David C . (2012). Biological diversity of the Minnesota caddisflies (Insecta, Trichoptera). ZooKeys 189:1–389. doi: 10.3897/zookeys.189.2043. Description of Nemotaulius hostilis on page 259. Nimmo, Andrew P. (1971) The Adult Rhyacophilidae and Limnephilidae (Trichoptera) of Alberta and Eastern British Columbia and Their Post-glacial Origin. Quaestiones entomologicae 7:3-234. Description of Nemotaulius hostilis on page 124. Resh, Vincent H. , Hannaford, Morgan , Jackson, John K. , Lamberti, Gary A., and Mendez, Patina K. (2011). The biology of the limnephilid caddisfly Dicosmoecus gilvipes (Hagen) in Northern California and Oregon (USA) Streams. Zoosymposia, 5:413–419. Schmid, Fernand. (1952). Les genres Glyphotaelius Steph. et Nemotaulius BKS (Trichop. Limnophil.). Bulletin de la Société Vaudoise des Sciences Naturelles 65(280):231-244. Description of Nemotaulius hostilis on pages 229 to 231. Wallace, J. Bruce. (1996). The Role of Macroinvertebrates in Stream Ecosystem Function. Annual Review of Entomology, 41:115-139.